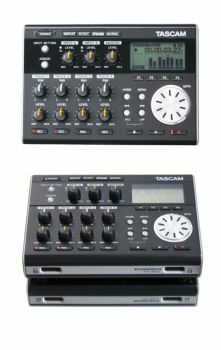 The Tascam DP-004 is compact and fun-looking with lots of buttons and knobs. It is about the size of a small paperback book (6 x 4 x 1.2 inches) and has a very smooth and lightweight feel. The Tascam DP-004 body is made entirely of plastic. The DP-004's screen is a little small and dim for this author's taste, but it is bigger than the Zoom H4 and Zoom H2 screens. It is not as big, bright or legible as the DR-1 screen. The buttons are crisp and responsive. The knobs have a rubbery feel and a smooth action. The Tascam's PS-P520 AC adapter is optional. The Tascam DP-004 has more of a learning curve than we expected. We spent 15-30 minutes reviewing the Quickstart chapter (all 27 pages of it) in the Owner's Manual before successfully layering 2 very simple tracks. At times, the DP-004 felt less intuitive than the Zoom H4 multitrack feature, but after practicing a few times, we got the hang of the DP-004's "Song Management" and "SD Card Management" procedures. Navigation through the DP-004's menu tree is accomplished with a wheel on the front of the unit. The Tascam DP-004 can accept SD and SDHC media cards. The SD card slot is in the back of the battery compartment, on the bottom of the unit. The Tascam DP-004 has a mini USB 2.0 port, two(2) unbalanced 1/4" mic/line inputs, a switchable guitar input, a mic/line-guitar switch and a combination 1/8" line out/headphone jack with a dedicated volume dial. The USB 2.0 connection is fast. Review more Tascam DP-004 specs at Tascam's website. We did not subject the DP-004 to a battery life test, but it seems good. Average performance is estimated at 8 hours. The internal mics of the Tascam DP-004 sound very good. Warm, natural and fairly quiet. Unfortunately, the signal we achieved using the Audio Technica AT822 as an external mic was not quite as strong or clean as the one we achieved with the internal mics. The Tascam DP-004 does not have phantom power (48V) or plug-in power (~5V), so your microphone choices will be limited to the internal mics, battery-powered mics, or a condenser mic with an external phantom power supply. Based on the examples in the Owner's Manual, the DP-004 may sound best when using its built-in mics for vocals and the 1/4" inputs for guitar or other instruments. The Tascam DP-004 is an affordable, compact, multi-track recorder with good sound, good storage capacity and a bit of a learning curve. It is not quite as user-friendly as larger digital multitrackers by Fostex and Samson and the lack of phantom or plug-in power limits its utility, but it could be an ideal sketch pad for songwriters on the go.